Illustrator Coordinator Anne-Marie Perks has worked tirelessly for illustrators in the SCBWI British Isles Chapter since its inception. As the recipient of this year's Outstanding Contribution Award, Loretta Schauer and Bridget Strevens talk to Anne-Marie about her work and memories. Q. Can you tell us about how you started out in children's illustration and your background as an art director? AM. Not to reach too far back, but I actually started out studying to be a sculptor and ceramicist in art school at University California Riverside. I loved doing 3-dimensional figurative work and working with visual narratives (I still do). Later on, that love of working with visual narratives led me to adding animation study to a BA degree in Illustration and to my MA in Children's Illustration from North Wales School of Art and Design. Before I got into children's illustration, I worked in editorial design and was an art director for 10 years. When I left school, I found out very quickly that working as a fine artist was hard. So, when a job came up to work with a newspaper as a graphic designer, I applied. It's still a mystery in my mind how I got it because I knew nothing about publication design, but I guess they felt they could teach me all I needed to know. On my first day I was introduced to the editorial staff and other artists as having a fine art degree - which at the time got me 25 cents more an hour than anyone else! The learning curve was steep, deadlines relentless and after 6 months I decided I wanted to work for quality four colour magazines featuring fashion and art. I embarked on a year of classes in package design, typography and layout design resulting in a post graduate diploma in graphic design, and that job. Working with Desert Publications gave me the opportunity to learn more skills in layout, working to imposition (signature layouts for the magazines) setting up photo shoots for interviews, food, art and fashion and doing design studio work. I also started doing freelance editorial illustration work for a variety of clients including the publishing company I was working with. I loved being an art director and designer and what I realise now is that it all comes back to telling stories using text and image. In those days, most illustration was done in black and white with colour added in percentages of black to make up the colours. I'm still very handy with a knife from the many amberlith overlays I cut! Initial caps had to be blown up and redrawn to take out all those pixel steps, then reduced and type wrapped around it! Payment for editorial illustrations was $50 for one black and white. Once I came to my design director with an illustration of Don Quixote charging with lance and horse for an editorial piece on the new windmills showing up everywhere across the desert. I remember he said, "Wow, you really pulled out all the stops this time. What a great illustration!" So, I asked if I would get more money in that case. "No!" was his answer. I found myself completely engaged in the world of children's book art and storytelling and started the process of how to get into that field. During this time I was raising two sons as a single mother. There wasn't much time between taking care of children and working. When my youngest son was 6 years old, I met my current husband at the publisher where we both worked. He changed many things in my life including where I now live; he is British. After the birth of my first daughter, I didn't want to work outside of the home, so started working as a freelance illustrator full time out of my own studio. 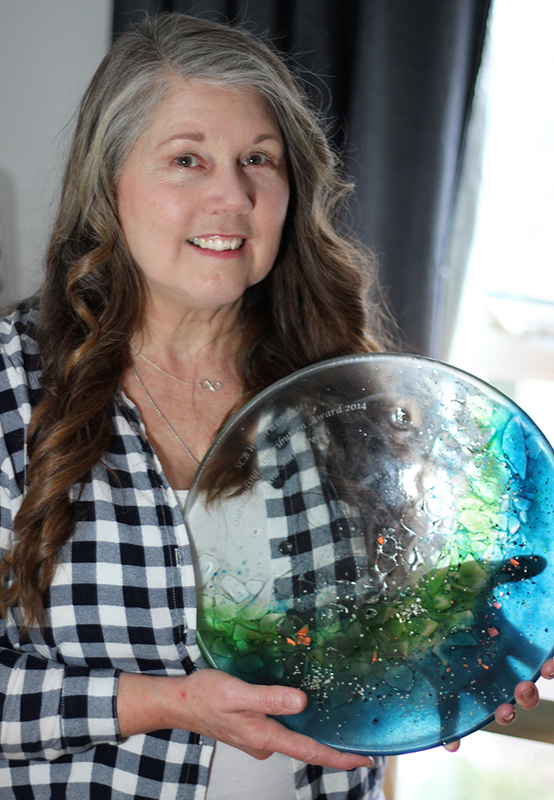 By the time I had my second daughter (four children if you are counting) I found myself completely engaged in the world of children's book art and storytelling and started the process of how to get into that field. By then my two daughters were both in diapers so I can tell you those early days were challenging! It was in that search that led me to studying with Marla Frazee at Art Center Pasadena. The class was intense. I had to hire a child minder to give me time to work and left that course with the foundation of my portfolio. Before I took Marla's class I had found SCBW (no I yet) and attended my first SCBW conference at Venice Beach (1991). It was overwhelming to find what I thought was an amazing source to learn about children's publishing. With an overlarge portfolio (you can tell the ones with fine art background) I went to my first one-to-one review with author illustrator Dennis Noland. My background in the world of designers and art directors had prepared me on how to sell myself, so I already had initial contacts for spec work from various publishers. Dennis Noland was a wonderful first reviewer giving me lots of information on art technique and composition approaches and a great piece of advice, "When your work is turned down, don't ask why and don't look back, just keep developing your work and resubmitting." (paraphrased) It was at the second conference I went to that the I was voted in and SCBW became SCBWI. It is hard to imagine with so many courses out there now on illustrating for children, that at one time there was very little information or guidance on getting into this type of work. SCBWI provided what I really needed then: information, education and inspiration. Everyone I've met over twenty odd years through SCBWI is passionate about what they do, and very generous with their time and experience. It led me to wonderful friends, getting published and to my first agent. Q. Who in the world of illustration do you admire? Do you think they have influenced your work? AM. There are many and they cross between time periods, fine art and illustration. A few are: Arthur Rackham, Edmund Dulac, Gustav Klimt, James Jean, Dennis Noland, Kelly Murphy, Jillian Tamaki, Scott Fischer, Greg Swearingen, Floyd Cooper, Jim Kay, Rebecca Quay, Yoko Shimizu, Greg Ruth, and the list goes on. Yes, they influence my work, definitely. AM. Over the last year and 8 months I've worked most of the time completing two wordless books for Book Beyond Words, a niche publisher presenting difficult topics for people who find it easier to understand pictures than words. The books follow a young girl's journey with domestic violence. 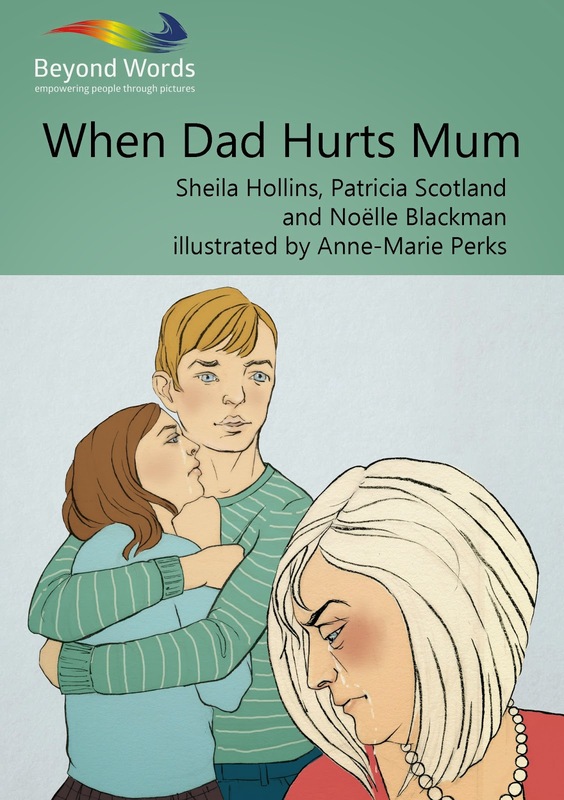 In, When Dad Hurts Mum, Katie deals with an abusive father, and in the second book, Finding a Safe Place From Abuse, Katie copes with an abusive live-in boyfriend. You can read more about the unique process in developing these books on my blog. Inside illustration from When Dad Hurts Mum. Q. What is your typical process? AM. Now that's a good question! It depends on the project and what the final outcome will be for that project. In the past, I had a split approach to commercial work and children's illustration work; commercial work being digital and children's in traditional media. The books I'm working on now combine Kuretake brush pen line work with digital colour! I start all projects with lots of thumbnails and exploratory drawings mixing in gathering good visual references as I go. Once I settle on character designs, settings and compositional approaches, I look at mediums I think will best suit the project. Much of my work in the past has been in watercolour though I also work in oils, gouache, crayon, collage, coloured pencil and digital. Later on in the year I'll be doing a Featured Illustrator article, so will go in more depth then. Q. What would be your top tips for someone wanting to improve their craft? AM. The top tip I would give above all is to draw, draw and draw some more. But not just any drawing, draw with goals in mind. Goals might be to improve anatomy, speed, faces, animals or urban landscapes. Whatever the goal, having one dramatically improves your practice and development. Study other artists, from all ages. Explore how they did what they did by doing master drawings or paintings. You can learn a lot about process and ways of thinking in ways just reading about it would never teach you. "Keep working, get feedback from your crit group and industry professionals regularly and set yourself personal briefs that stretch you and keep your work evolving"
Look widely at what is being published. It doesn't hurt to spend an afternoon or day in the children's section of large book stores regularly and note down who is publishing those books you love. Study visual storytelling of all kinds. The lines between film, animation, narrative gaming, comics and picture books are actually very thin. Going to Bologna opened my eyes to styles that look French, Italian, American, British, Korean and so on and what styles seem to cross all borders. Look then go on to the next step. I once read that any illustration work older than 5 years is already dated. Do you find that as scary as I did? This top tip is to keep working, get feedback from your crit group and industry professionals regularly and set yourself personal briefs that stretch you and keep your work evolving. Caldecott winner Eric Rohmann recommended at an Advanced Illustrator's Workshop with the Highlight's Foundation to take a week off every few months to explore media and experiment with new materials and ideas. Q. How did you find out about SCBWI and how did you come to be involved as a volunteer? AM. I already explained above how I found SCBWI. When I first joined I had two babies in diapers, 2 older sons leaving me very little spare time alongside living too far away from family who could help with child care. It wasn't until I moved to the UK in 2000 that I found myself in a position to offer volunteer help. I was in a new country not knowing anyone except family, but luckily there was SCBWI. The very first meeting I went to was in a small tower room at Central St Martin's. My we have grown since those days! I was excited taking on the volunteer position of regional illustrator coordinator not only as a way to make contacts and develop professional relationships, but also to help develop opportunities for other illustrators to grow in their craft and make important contacts between peers and in the industry. Q. Any tips for managing a SCBWI volunteer role alongside a professional one? AM. When I've figured that out I'll let you know! The most important thing I've found is when you start something you really care about in the process of giving back, gather around you lots of people who care as much as you do and want to help do the same thing. We would not be where we are today without others volunteering their time, ideas and energy to make the wonderful opportunities offered to SCBWI member illustrators happen. Also, I like the idea of, we've got each other's back. Q. What has been your most memorable moment in SCBWI? AM. You mean other than opening the door to a woman holding a big box saying, I know I didn't call first, but‚ (You know who you are!) I think it ended with, you won this year‚ Outstanding Volunteer Award. This might not make sense to those who didn't see the video at last year's conference, but to say I was surprised isn't even strong enough. It took me a while to take all that in. Yikes! It has been amazing to be part of a journey from less than 100 members to where we are now, to move from one illustrator event a year (Illustrator Day) to 5 Masterclasses, a Picture Book Retreat, an annual 2 day conference, an annual Illustrator Member Showcase and the Undiscovered Voices Illustration Competition. Another important addition has been the illustration editorial features, monthly featured illustrators whose work sets a new visual tone to Words and Pictures every month and the Advent illustration calendar bringing a new image daily on the run up to Christmas. Q. What would you like to see happening next for illustrators in SCBWI? AM. At the Illustration Committee meeting we talked about offering more for published illustrators and author illustrators and exploring online seminars that point to upcoming competitions like Undiscovered Voices or the Showcase. Student outreach is important to us right now and working on ways to draw attention to the benefits offered by SCBWI and that phrase bandied around a lot in education, life long learning. Ideas include competitions that are specifically set for student submissions, Saturday only admission for students at the conference, maybe a student submission section to the annual Showcase. Of course all great ideas take people willing to give time and energy to make them happen. Fascinating to read more detail about your AD days - with all you've done for SCBWI you are still thinking of new ways to go for professionals and students too - Anne-Marie you are amazing! I can absolutely see why someone came knocking at your door, award in hand. Wow - so absolutely deserved. Your current work, with Beyond Words, just goes to show the power of images. Thank you, Anne-Marie, for taking the time to answer these questions. Fascinating interview Anne-Marie. Congratulations on receiving your award. Thank you for creating opportunities for the illustrators of SCBWI, much appreciated! This is a really interesting interview,Anne-Marie. Lovely to read your story Anne- Marie - many congratulations again on your OCA!